Of course this is no laughing matter given the reliance on the OWGR to determine major fields, including two weeks from now when the Masters invites the top 50 not already exempt. With the March 29th deadline looming, R&A Chief Martin Slumbers explains how the failure to reach a Brexit deal could have huge ramifications for The Open at Royal Portrush. A no-deal Brexit could potentially see the return of a hard border on the island of Ireland, something Slumbers could do without. “The future of the border is our number one concern. We’ve got over 2,000 containers to get across the Irish Sea. Hey how about us people who have to cross those borders! Lots to unpack on the caddie alignment saga, so let’s start with the USGA’s release bullet points summarized here for Golfweek. The update issued Wednesday could be confusing with so much language and follow up points when actually very little was changed. So here’s a quick summary since my initial reading assumed Haotong Li would not have been penalized. Turns out, he still would be under this reading because his caddie was aware he was deliberately behind him when he took his stance and proved this awareness when he tried to walk away as Li moved into his stance. Li could have backed off and things would have been fine. This escape clause now extends to all shots, not just the putting green exception. As for Denny McCarthy in Scottsdale, the governing bodies concluded he had not taken a stance and therefore the initial penalty call was incorrect. So while the PGA Tour rescinded the penalty and the USGA/R&A took a hit from players jubilant that the Tour had their back, the change was actually made because of an incorrect ruling. That said, the incorrect ruling stemmed not from official incompetence but the overall confusing nature of the rule and debatable nature of whether McCarthy took a stance. LIBERTY CORNER, N.J. and ST ANDREWS, Scotland (Feb. 6, 2019) – The USGA and The R&A have provided two clarifications to Rule 10.2b(4) regarding restrictions on caddies standing behind players, which take effect immediately. "Keith Pelley defended the Saudi event, saying it was 'transformational.' But then a bone saw and a vat of acid can be pretty transformational too." Nice line among many gems from Golfweek’s Eamon Lynch summing up the week “grow the game” was used to hide behind a deplorable all-around showing by the European Tour in going to Saudi Arabia, where no fans showed up, media was almost non-existent and players grabbed the Crown Prince’s dirty money. Conscientious objecting is a fraught business, of course. Is a golfer who can’t countenance competing in Saudi Arabia because of human rights abuses then obliged to skip the PGA Tour stop in China? How current or egregious or well-publicized must violations be to warrant a boycott? And what about events staged in countries that arm evil regimes? It’s a fine, blurred line between conscience and compromise. Yet sometimes a decision is deceptively simple. Like when a golf tournament is manufactured purely as a public-relations fig leaf for an abhorrent government. Last week’s Saudi International was just such a situation, no matter how much ‘Whataboutery’ was trafficked by slavish lickspittles in their attempt to justify enjoying Saudi hospitality. Still, let’s play out with arguably my favourite take on it all, which emanated from the American Patrick Reed. Asked if he had any safety concerns about visiting Saudi Arabia, last year’s Masters champion dismissed the idea. “No,” breezed Reed, “because the European Tour has us covered.” On the one hand, yes. It feels vanishingly unlikely that anything unpleasant would happen to golfers paid to burnish Saudi Arabia’s dismal image. On the other, if the chips do go down, and you want a really crack unit to have your back covered, who you gonna call? The SAS, Delta Force, Seal Team Six, or … hang on, what was it again? … ah yes. The European Tour. Veteran of zero deadly missions, but several increasingly daring sorties into enemy coffers. One other noteworthy item was this column from Morning Read’s Alex Miceli taking issue with Brandel Chamblee highlighting just some of the host’s more deplorable acts while Golf Channel did not treat this inaugural event as something of great importance (nor did any fans!). He fell back on grow the game to justify his and the player’s appearance there. At the same time, touring pros understand that golf’s future could be in jeopardy without trying to expand the game’s base and expose a country such as Saudi Arabia to world-class tournament golf. Can we all at least agree that, based on a tournament with no fans and cash merely being grabbed, the game was not “grown”? It’s customary for the European Tour to give Honorary Lifetime Memberships to players who win majors and like to turn up their events, even when they go to places where they conduct public beheadings. Reed said: “Words can’t really describe how proud I am right now. It’s always been a dream of mine to be a worldwide player and play on both Tours. Now, to be able to fulfil that on the European Tour, and to travel the world and grow the game means so much to me. “For the European Tour to have faith in me and give me this opportunity means everything. I hope to show everyone and show the Tour how proud I am and represent the Tour really well in the game of golf. We’ve seen players travel to far away lands in search of easy World Ranking points and sell their mother’s for year-end world top 50 status. And now, look the other way on carved up journalists, beheadings, beatings, violent bigotry and 15 of 19 9-11 hijackers just to help the Crown Prince see the error of his nation’s murderous ways. Eddie Pepperell is at this week’s European Tour event and clearly conflicted since he noted three other shady countries the European Tour might reconsider visiting. Ultimately, he can’t resist the points according to his latest blog post. I can really only speak for myself, and plus, remember I’m not being paid to be here, so I’m only slightly less immoral than the top guys who have showed up. For me, if I didn’t play, I sacrifice the opportunity to play against the best in the world, I miss a chance to improve my world ranking also, which objectively speaking, does hold some importance for me, since if I fall out of the Top 50 before April then I won’t be eligible for a PGA Tour event I have scheduled to play. And that means losing flights etc and having to pay for new ones, which you might say is no problem because I’ve earned a lot of money lately, though resentment isn’t good for anybody. On top of all of this, maybe, just maybe, the Regime out here really do want to change. Maybe they’ve recognised the perilous state of their own affairs and in particular their reliance on a fossil fuel that won’t be here forever. Maybe the Crown Prince will present a solar panel trophy instead of an oil derrick. Or not. European Tour Chief Keith Pelley finds the treatment of Haotong Li “grossly unfair” as did many of the very players heading to Saudi Arabia this week, reports Golf.com’s Dylan Dethier. I’ve seen a number of tweets saying we shouldn’t be here in Saudi Arabia. But let me remind you of this; Only last year women weren’t allowed to wear any clothes AT ALL in my house. For a man who likes to read, Pepperell may want to brush up on Saudi Arabia’s record before cracking jokes. He’s not alone, as Ian Poulter is playing a low IQ card. He is not a stupid man. Most players are interested in little else. "I'm probably not the most educated man in the world to sit down and have a discussion about politics," Ian Poulter told BBC Sport. "I tend to err on the other side and try not to go too deep into that because my IQ is not great. "Obviously, we all know what's going on around the world, but when I see the tour trying to make good and give us opportunities then I think it is a good thing." He went on to cite the world rankin points in play. So maybe he’s not entirely wrong about the low IQ. Sadly, not one of the parties taking the Crown Prince’s money this week has brought themselves to condemn the person putting up this week’s purse for the hideous demise of journalist Jamal Khashoggi. Or countless other grotesque acts against humans. The Crown Prince Mohammad bin Salman bin Abdulaziz Al Saud, who Pelley credited with envisioning this tournament, is the likely green-lighter of this event. So to recap: journalist murdered and dismembered in October and the European Tour forges ahead even though most world intelligence agencies pin the hideous act on the tournament host. But the R&A for not letting European Tour referees give Haotong Li and his caddie a hall pass? Here’s my first take for Golfweek on Pelley’s attempt to distract from this week’s disastrous money grab as well as a plea to not throw out the new golf Rules baby with the bathwater. Randall Mell at GolfChannel.com takes on the players participating in this event and claiming they are not politicians. Corporations are known for their often blind pursuit of the bottom line, but tour pros aren’t blind, though they may be going to Saudi Arabia with their eyes closed. “It is not the Saudi Arabian people who ordered Khashoggi murdered,” Kenneth Roth, head of the Human Rights Watch, told France’s AFP during the World Economic Forum last week. “It is a particular government and a particular leader. If the crown prince were to show up to present the trophy Sunday at the Saudi International, it probably wouldn’t be a good time to ask. 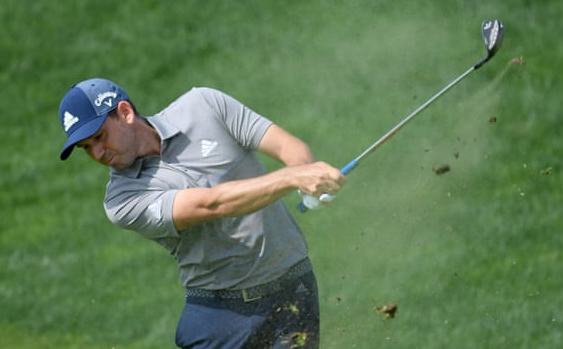 In an unprecedented rebuke of the governing bodies—not coincidentally the week his tour lands in lowly Saudi Arabia—European Tour Chief Keith Pelley has blasted the Haotong Li penalty as, of course, detrimental to growing the game. I’m about to dig in on a column about all of the things this brouhaha is really about, but in the meantime here is Pelley’s statement followed the R&A’s response that arrived 92 minutes later in my Inbox. I am sticking up for my players and making a lot of noise from my luxury hotel where the Crown Prince himself left me a welcome note! Martin Slumbers, Chief Executive of The R&A, said, “We have reviewed the Li Haotong ruling made by the European Tour referees and agree that it was correct. There has been some misunderstanding of the new Rule and I would point out that it is designed to prevent any opportunity for the caddie to stand behind the player as he begins to take his stance. Whether the player intends to be lined up is not the issue. We appreciate that it was a very unfortunate situation yesterday and I completely understand Keith Pelley's concerns when a Rules incident occurs at such a key stage of a European Tour event but there is no discretionary element to the Rule precisely so that it is easier to understand and can be applied consistently. Here is our chat on Morning Drive today about this. Pelley Says European Tour Has Done Its Security Due Diligence In Defending "Middle East strategy"
European Tour Chief Executive Keith Pelley is attempting to get out front of the looming disaster that is a professional golf tournament in Saudi Arabia only months after the dismemberment of Washington Post journalist Jamal Khashoggi last fall. Crown Prince Mohammed bin Salman, who was credited with bringing the European Tour event to his country, likely ordered the killing at his country’s Turkish consulate. The previous prohibition is extended so that, once the player begins taking a stance for the stroke, and until the stroke is made, the player’s caddie must not deliberately stand on or close to an extension of the line of play behind the ball for any reason. There is no penalty if the caddie accidentally stands on or close to an extension of the line of play behind the ball, rather than in trying to help in lining up. Good rule of thumb here caddies: just don’t stand anywhere behind the player anywhere near the start of a shot and you’ll be fine. There is a bigger picture issue here as it relates to the new rules and pro golfers being governed by amateur organizations: while this is a violation and was likely accidental, there is a danger of professionals citing this as yet another example of the rules excessively monitoring their livelihood. I’ve picked up some stray jabs and concerns this week about the new rules, and while it’s hard to tell if it’s just a product of the transitional learning adoption phase or something deeper, remains to be seen. Bryson DeChambeau struggled to the 36-hole lead of the Dubai Desert Classic despite proprioception problems. Proprioception (/ˌproʊprioʊˈsɛpʃən, -priə-/ PROH-pree-o-SEP-shən), is the sense of the relative position of one's own parts of the body and strength of effort being employed in movement. It is sometimes described as the "sixth sense". Got to love that SMU education! Double-Hit Loophole Artists: Nice Try, But USGA Confirms Penalties Await! I know you all saw our Morning Drive chat about this on Monday, but as much as I’m enjoying the creativity and skill of trickshot artists who think they found a loophole in the new Rules of Golf, they have not. As I outline here for Golfweek, the trick shot that spawned a European Tour social video attempting the double hit ignores the very simple word “accidental” in the new more relaxed Rules. The story explains the penalty players will enjoy if they use such a ploy to get around a tree.